Home Book Reviews “FAT” IS A WINNER! Well, knock me over with a lamb chop, if Jennifer McLagan hasn’t won the prestigious International Association of Culinary Professionals’ Single Subject Award for her book celebrating–fat! And she beat out two really big names in food circles to do it: the other nominees were Under Pressure, by Thomas Keller, famed chef and owner of The French Laundry restaurant, and A Year in Chocolate by Jacques Torres (a famous name and the word chocolate in the title usually insures a win!). OK, so she didn’t win in the Health Category; that award went to Ellie Krieger, host of the Food Network’s show, “Healthy Appetite,” for her book The Food You Crave. Ellie and the other two finalists in the healthy-eating competition all endorse the same ol’, same ol’ (low-fat, olive oil, whole grains, fruits and vegetables, blah, blah, blah), but hey, it’s a step in the right direction! .Congratulations Jennifer! It is refreshing to see signs of a return to sanity in the food world and to see your courage rewarded. .Here’s my review of “Fat” that I wrote when the book originally came out:. 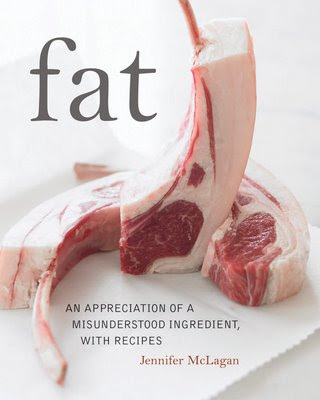 Jennifer McLagan, winner of the prestigious James Beard Cookbook Award for Bones in 2006, has taken a courageous stand in her latest book titled Fat. My first exposure to Jennifer was at the IACP (International Association of Culinary Professionals) conference in Seattle where she was also nominated for an award. I attended a workshop on food photography and at the awards ceremony on the closing day, found myself seated next to one of the presenters from the class. He had warned against using images with unpleasant connotations and bones were specifically cited as an example of things to be avoided. I couldn’t resist nudging him to point out the picture of the cover of Jennifer’s book adorned with a gorgeous plate of marrowbones featured in the program. Jennifer McLagan breaks the rules, and she does it beautifully. .She said, “It took a long time for publishers to talk to me.” (And she’s an award-winning author!) “The opening chapter is all about the importance of animal fat in our diet and why in the last 30 years we have been (wrongly) convinced to cut it out….It gives us energy. It boosts the immune system and some fats have antimicrobial properties. Others can lower bad cholesterol. There are vitamins that are only fat-soluble. Your brain is mainly made of fat and cholesterol, as are the membranes of your cells. It helps you digest protein, which is why you should eat chicken with crispy skin or well-marbled steak.” She points out that we have been eating animal fats for thousands and thousands of years. If it had been that bad for us we probably would not be here.. Fat includes recipes such as Roasted Pork Belly with Fennel and Rosemary, Duck Confit, Carnitas, and Butter-Poached Scallops. Stories, lore, quotations, and tips about fat’s place in culinary history and traditional cultures round out what is described as a “plump, juicy, and satisfying read for food lovers.” It contains 35 color pictures, as of course it would, seeing as how the author is herself a professional food stylist. .Obviously, as Jennifer told me, “We have a lot of hard work ahead of us.” True, but we are making progress, and emerging science supports those of us who embrace butter, lard, duck fat, bacon, marrowbones, and tallow for the life enhancing substances that they are. Hopefully, I won’t be the lone pariah at the next IACP convention. Celebrating Fat, IACP Cookbook award winner, Jennifer McClagan, New book. Bookmark. I just bought the book. It is absolutely beautiful, with lots of good information. A keeper for sure! !